The past year reminds us once again that every step forward can be accompanied by steps backward which forced us to often take food policy “victories” with a grain of salt. To help Food Policy Monitor readers take stock of the past year, we identify our staff choices for the Top 10 positive and negative food events in 2018, defined as events that had an important impact on urban food environments in New York City or elsewhere. On January 1st, minimum wages were increased in 18 states and 19 cities across the US. In the agri-food system, this affected the wages of fast food and farm workers, among others. As required by New York State’s Minimum Wage Act of 2016, in New York City, minimum wages for fast food workers increased from $12.00/hour to $13.50/hour, whereas for farm workers at large employers (11 people or more) from $11.00/hour to $13.00/hour. By the end of 2019 fast food and farm employees at both large and small (10 people or less) farms in NYC will see their wages increased to $15.00/hour, or what workers’ rights advocates see as closer to a “living wage.” The wages of fast food workers employed in the rest of New York State will reach the $15.00/hour minimum in mid-2021. The mandatory federal minimum wage is $7.25/hour. Higher wages benefit the most exploited participants in our food system and also put more money in the pockets of all low wage workers, enabling them to spend more on healthy food. In 2018, adoption of the Good Food Purchasing Program (GFPP) – a comprehensive effort to leverage the power of the “public plate” to support food systems that are ecologically sound, healthy, respect workers’ rights, promote animal welfare, and help local economies thrive – continued to expand across the US. On May 16, Cook County, IL – the second most-populous US county after Los Angeles County, CA – passed Resolution #18-1650 to adopt the GFPP. This success was followed by Washington D.C.’s Public Schools commitment to adopt the GFPP through the Healthy Students Amendment Act (B22-0313) which was passed on December 4 and enacted in early 2019 (A22-0566). Previously, the program was adopted by school districts in Los Angeles (2012), San Francisco (2016), Oakland (2016), and Chicago (2017). As more cities, counties and states adopt GFPP, they build a critical mass of support for a healthier, more equitable and sustainable food system. On December 20, the new Agriculture Improvement Act [H.R.2] (or Farm Bill) was signed into law. The new bill left out some of the most damaging provisions for the Supplemental Nutrition Assistance Program (SNAP) proposed in earlier versions of the bill, such as the proposed cuts of nearly $25 billion in funding, harsher work and job-training requirements,* and narrower categorical eligibility limits. Positive but deemed not-sufficiently-ambitious provisions included the approval of permanent mandatory funding for local food initiatives, beginning farmers, and organic farming research; the expansion of the Conservation Reserve Program – which preserves land from being plowed for crops – by 3 million acres; and $25 million for food waste reduction and composting initiatives through 2023. The bill also set a precedent with the establishment of the USDA Office of Urban Agriculture and Innovative Production to support investment in urban food growing methods as well as the allocation of $20 million for a new Farm to Food Bank program to facilitate the donation of excess food to emergency food providers. Despite its limitations, this outcome demonstrates the power of broad coalitions of elected officials, farm organizations and the food movement to defeat the most damaging proposals coming from the White House and Congress. * On December 20, however, the USDA proposed a new rule that would restrict the ability of states to exempt able-bodied adults without dependents (ABAWDs) from work requirements. Over the past year, attention to and support for measures to address food insecurity on college campuses has continued to rise across the US. 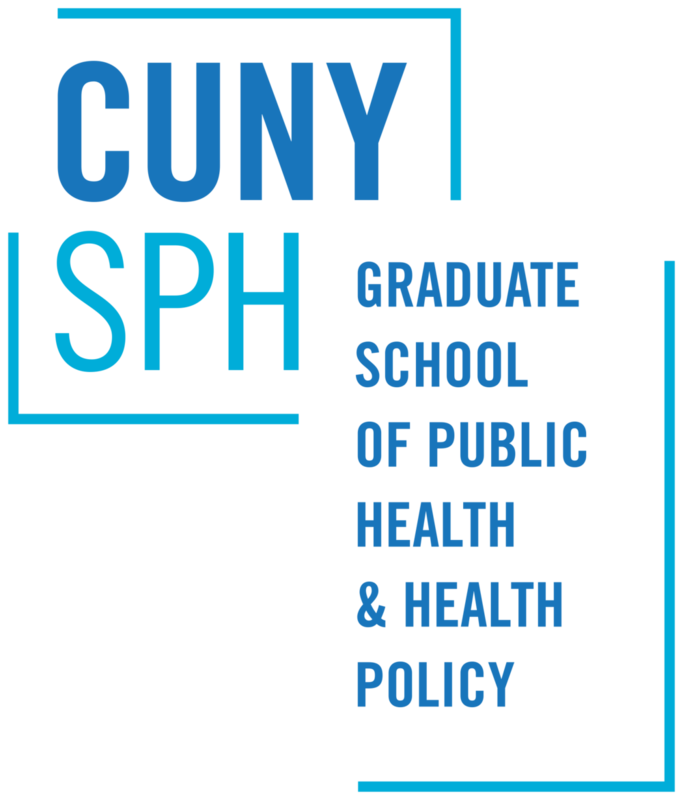 On August 29, New York State Governor Cuomo announced a statewide campus food pantry initiative for all SUNY and CUNY campuses as part of the No Student Goes Hungry Program. Less than a month later, on September 26, California passed Assembly Bill No. 1894 expanding the CalFresh Restaurant Meals Program to all California State University campuses independently from whether or not the county where the campus is located participates in the program. This legislation further expands the Hunger Free Campus Initiative which received $2.5 million with the Budget Act of 2017 and hunger-free designation Senate Bill 85. A new GAO report shows that only half of college students eligible for SNAP are currently enrolled, compared to 80% of other eligible groups. New attention to campus food insecurity can help ensure that hunger doesn’t undermine the academic success of low-income college students. On November 6, voters in the State of Oregon rejected a proposed measure (Measure 103 “Grocery Tax Ban”) which would have amended the Oregon Constitution to preemptively ban any new taxation or fees on the sale of food and nonalcoholic beverages in the state. The ballot measure attracted the highest amount of campaign contributions in the 2018’s elections – more than $7 million on each side – and, if approved, would have precluded cities to consider, among other provisions, taxes on soda and sugary beverages. Earlier last year, on April 6, the United Kingdom enacted its Soft Drinks Industry Levy (“Sugar Tax”) in an effort to reverse rising levels of childhood obesity. Since its announcement in 2016, the tax has lowered the sugary content of drinks by more than 50%. By defeating the proposal, Oregon voters showed they weren’t swayed by the industry disinformation campaign and reaffirmed their support for using government to encourage healthier diets. On October 10, the US Department of Homeland Security (DHS) proposed changes to the federal rule on the determination of Inadmissibility on Public Charge Grounds of non-citizens. Determination criteria were expanded to include, among other public benefits, participation in the Supplemental Nutrition Assistance Program (SNAP). Adults lawfully present in the US for more than 5 years (or who have the equivalent to 10 years work history in the US) are legally entitled to receive SNAP benefits. Children under 18 years of age, and other vulnerable categories, are exempt from these requirements and, together with US children living in mixed-status households, might lose access to key health and social benefits if the proposed changes were adopted. Fear of jeopardizing their stay in the US or their path to citizenship has already led immigrants to disenroll from SNAP, and even WIC, which is not part of the proposed rule. Estimates for NYC revealed that the modified rule can harm up to 475,000 New Yorkers and result in at least $420 million in economic losses. Across the country, more than 210,000 public comments were submitted in response to the rule, showing the broad public mobilization against immigration policies that depend on fear, stigmatization and threats to basic necessities of life. In 2018, the USDA rolled back nutrition standards of federally-funded child nutrition programs by codifying a new rule (83 FR 63775) which allows “Flexibilities for Milk, Whole Grains, and Sodium Requirements,” and relaxes the requirements previously established through the Healthy, Hunger-Free Kids Act of 2010. 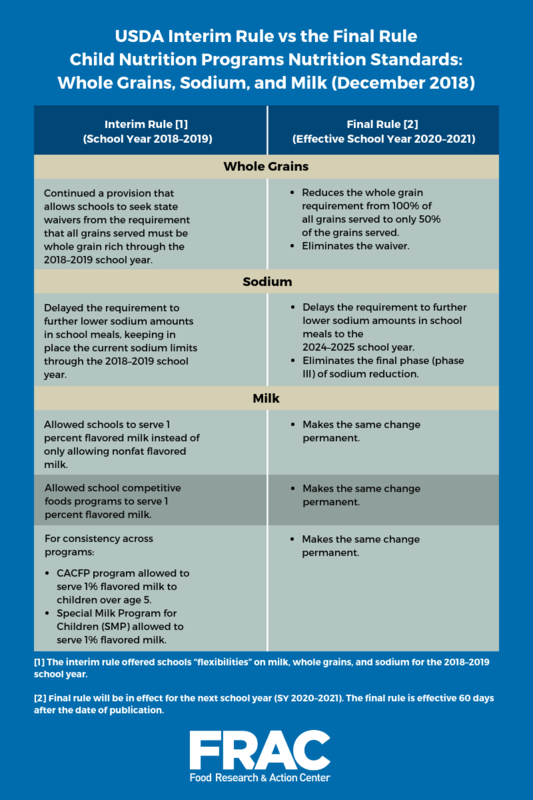 Specifically, compared to previous standards, the new rule reduced whole grains requirements from 100% to 50% of the total grains served and delayed the next levels of sodium reduction in school meals by seven years. Additionally, the rule made permanent the proposed flexibility to serve 1% flavored milk instead of nonfat milk. The changes will become effective on February 11, 2019. Healthy nutrition advocates believe the new rule jeopardizes improvements in the health and cognitive performance of children attributed to prior nutrition standards. In relaxing the rules, the USDA chose to value the convenience of the food industry over the future health of the nation’s children. On the same day voters in Oregon defeated Measure 103 – which proposed to ban any new taxes on food and beverage goods – the State of Washington passed Initiative 1634 “Prohibit Local Taxes on Groceries Measure,” a decision that chose the opposite direction. The measure did not repeal Seattle’s earlier sweetened beverage tax (Ordinance 125324), which went into effect in January 2018, but will preclude any other cities in the state to follow suit. The state of Arizona barred cities, towns, and counties from imposing new taxation on soda in March (House Bill 2484), and, three months later, another anti-taxation measure was passed by the State of California which banned soda taxes through the end of 2030 (Assembly Bill 1838). In addition to Seattle, soda taxes are currently active in Berkeley, CA (2015), San Francisco, CA (2016), Philadelphia, PA (2016), Oakland, CA (2016), Albany, CA (2016), and Boulder, CO (2016). The victories of the bans in Washington, Arizona and California show the power of the food industry to frame policy debates and the increasing use of preemption to deprive cities and counties from acting democratically to protect local well-being. At midnight on Saturday December 22, US federal government begun a partial shutdown – still ongoing and declared the longest recorded in US history – which put at risk the food safety and food security in the country. Due to the shutdown, the US Food and Drug Administration, which oversees food safety inspections for 80% of the US food supply, has suspended all routine food safety surveillance efforts on domestic food-processing facilities and has furloughed 41% of its staff. This has increased the risk for Americans to contract food-borne diseases such as E. coli and salmonella. The shutdown has also jeopardized the food security of government employees – 800,000 of which continue to go unpaid – and Native American tribes who extensively depend on federal funding for the provision of health and emergency food services. Funding for the Supplemental Nutrition Assistance Program (SNAP) itself is guaranteed only through February. In the last 20 years, conservatives have increasingly used government shut downs as a way to force policy change, a risky strategy that bypasses traditional procedures for resolving political and budgetary differences. On October 2, 2018, the well-being of vulnerable workers in the US was put in jeopardy by a US Supreme Court ruling which prohibited workers from banding together to challenge violations of federal labor laws – including wage and hour violations. Food workers who are frequently mistreated by employers will be especially hard hit by the ruling which bans collective action – guaranteed by the National Labor Relations Act – and limits arbitration of violation claims to individual cases. Importantly, the halt precludes the possibility of civil rights class actions advancing claims of discrimination based on race, gender, and religion. Before the ruling, an overall of 44%, or more than 48 million, nonunion private sector employees were not barred from collective legal actions. Forcing workers to resolve grievances on an individual rather than collective basis further undercuts the power of labor unions to improve the well-being of workers.